Creepy Vampire Drive-in is a young adult contemporary adventure fantasy written by Ronnie Stich. Alicia was wrapped up in some particularly puzzling math homework when she was interrupted by the ringing of her cell phone. It was her best friend Kathy calling, and she had some strange and dire news to convey. During a dinner out with her parents the night before, Kathy’s deceased Aunt Marilyn appeared to tell her that the Mystical Order of Ghosts, Enigmas and Cryptids had news of a threat that could mean the destruction of humanity. Aunt Marilyn was the Order’s Earth Ambassador. While Alicia would really rather just continue doing her assignments and forget about the whole mystical business, the thought that next weekend’s sleepover wouldn’t be happening because of doom and destruction was enough to get her to wearily agree. When the two friends got together with the third human member of The Ghost Friends Chapter, their English teacher Mr. Walsh at Sinatra Middle School, Aunt Marilyn appeared and began to tell them about the threat. Ronnie Stich’s young adult contemporary fantasy, Creepy Vampire Drive-in, is fast-paced and entertaining. I loved the author’s take on vampires and the bad rap they’ve had for centuries since coming to this planet, and enjoyed watching as Kathy, Alicia and their vampire friend Kevan work to thwart his uncle’s plan to brainwash the humans coming to watch a doctored old vampire movie. This story ranks high for humor and sly chuckles and it’s action-packed to boot. Kathy’s Aunt Marilyn is a compelling and original character, and I’d love to see her, her niece and her friends, and the Mystical Order of Ghosts et. al return in subsequent stories. 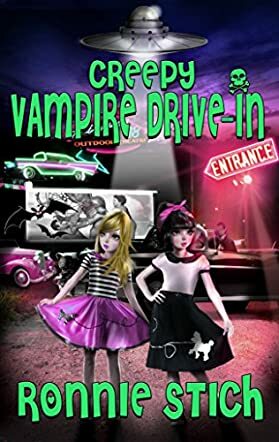 Creepy Vampire Drive-in is a bit of science fiction, a bit old-style vampire story, and a gripping contemporary adventure-fantasy, and it works beautifully on all accounts. It’s highly recommended for vampire, humor and adventure fans of all ages.